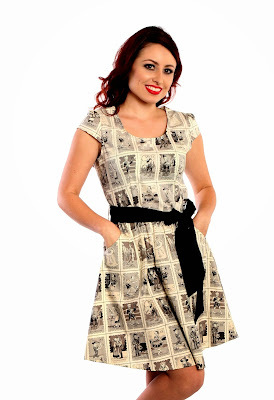 This Folter "Dead Society" dress makes me wish I had an office to go to every day. (Instead, I'm here on my couch in ratty pajamas). This would be adorable for business ladies or secretaries both! Click on the zoom to see the lovely dead-people-picnicking pattern on this dress. This "Skeleton Key" dress by Folter would be perfect for picnicking, lakeshore outings, or a boat ride. Don't forget your sunscreen! Folter's "Deadly Games" features vintage illustrations from a Spanish tarot deck. Perfect for a Springtime evening tapas or margaritas outing! "Endangered Skulls" is a stunning and flirty little summery dress. Maybe a little bit short for me, being that I'm an eldergoth.